Comfort Meets Style with Demetra | Cute Comfortable Heels Just For You! Cute Comfortable Heels in one Brand! How can a shoe be so cute, yet comfortable? Dansko Demetra is an ideal blend of total comfort and ultimate style. Dansko made it possible for you to be comfortable and fashionable in a 3 ¼ inch heel. Yes, this shoe is a 3¼ inch heel but don’t be fooled by its height. Find out why these cute comfortable heels are so hot this season! Finding comfort in a 3 ¼ inch heel shouldn’t be a challenge, especially with a block heel. Demetra’s block heel adds comfort, stability and is wide enough to help support your delicate ankles. The heel is so great when it comes to standing or running errands since it’s much more stable than the typical stiletto. It also works best on relieving stress that pesky stilettos place on your arches. For those heel lovers, a wide heel is your hero and a cushioned footbed is your sidekick. They both help you fight foot fatigue and work as a dual to provide you with unbelievable comfort. Your sidekick is just as important as your hero, as it molds to your feet for unbelievable support. As the footbed molds, you’ll experience heel and arch support, which helps evenly distribute your weight for incredible comfort. Comfort and support are extremely important for us, but so is our look. Demetra is a perfect shoe to help refresh your look this spring while giving you the comfort you need. 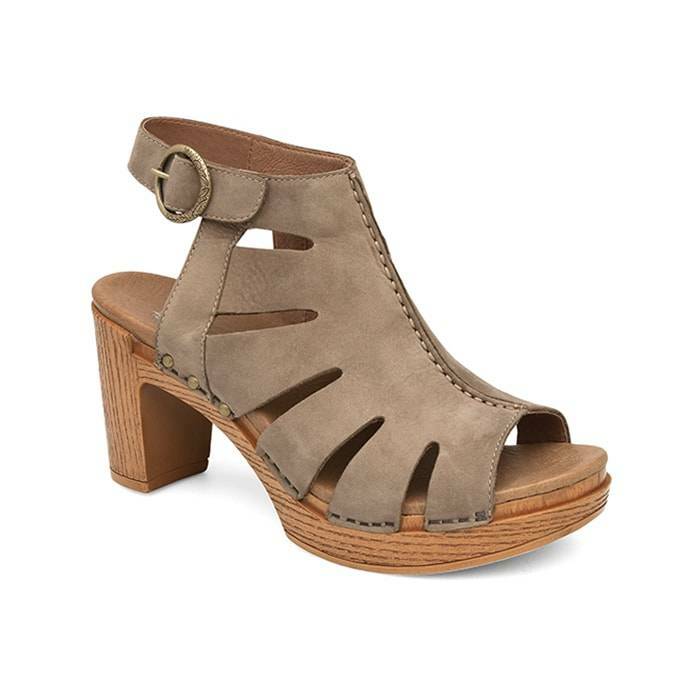 This is a beautiful heeled sandal with leather uppers and a charming wooden platform. Its leather is shockingly butter soft; you will be amazed how your fingers effortlessly glide through every curve of the shoe. Its wooden platform perfectly complements your everyday look or evening outfits. This is a shoe you will want to wear on the daily and for most special occasions. Demetra is so beautifully designed; we cannot forget the shoe’s charming side cutouts. They are perfect for those hot days when our feet tend to perspire most, which keep your feet fresh when you need it most. In addition, its adjustable hook and loop ankle strap help secure your feet. As much as we love the way we look, staying on your feet is our best compliment. Take on the catwalk, spice up your look for a night on the town, or make a statement at the office; Demetra’s footbed will keep you comfortable and amaze you in every situation. If you fell in love with Demetra, we invite you to visit us at any or Lucky Feet Shoes stores to try on a pair today! Click here and find a store near you and let us help you find the best shoes for your unique feet. If you suffer from foot pain, back pain, plantar fasciitis, bunions, heel spurs, fallen arches, flat feet, hammer toes or any other foot problems; click here to schedule a free foot analysis. We can help you reduce your pain and keep on your feet.